Japan's Sharp has recently provided an irrigation system to 600 farmers in Malawi. Equipped with a solar pump, the device is installed on the Shire River in the south of the country. Farmers in several counties of Malawi irrigate their plantations to increase crop yields. Fortunately, the country has significant water resources, such as lakes Chilawa, Chiuta, Malombe or Malawi. There are also rivers like: Rusa, South Rukuru… and Shire. To irrigate the plantations, farmers use treadle pumps or simply use containers to collect water from the river; an exhausting and time-consuming job. In the town of Lilangwe, Blantyre County, farmers will henceforth be able to do without the old methods. 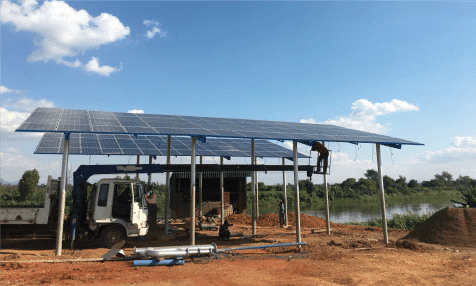 The Japanese company Sharp, in partnership with the Foundation for Irrigation and Sustainable Development (FISD), has recently provided an innovative irrigation system, which operates with an electric pump directly connected to a solar mini-grid. The small power grid, which operates the pump installed in the Shire River, has a 255 W capacity. It is composed of 120 polycrystalline Sharp solar panels, installed by Seine Tech. Funding for the project was provided by Millennium Challenge Account Malawi (MCA-Malawi), a government agency. “Currently, nearly 450 farmers own portions of land here, but our goal is to reach the number of 600 producers spread over 50 hectares. As the FISD, we are aware that by equipping communities in this way, we provide them with alternative sources of income, and prevent them from overexploiting natural resources,” explains the FISD. The implementation of the irrigation system, which runs on solar energy, is part of the National Environment and Natural Resources Management (ENRM) project. It is a government programme for which Malawi has allocated a budget of nearly $28 million. The country relies on the Shire River, already equipped with several hydroelectric dams, to irrigate the land it crosses. To do this, it is necessary to have the necessary energy infrastructure and that is why the Electricity Supply Commission of Malawi (ESCOM), the public company responsible for electricity distribution, is the first supporter of the project. A large part of ENRM’s budget is therefore allocated to local agriculture, through the fight against deforestation and support for irrigation, which has just taken the form of an innovative system installed using Sharp equipment. The company has been involved in several solar projects in Malawi, including the installation of solar kiosks in rural areas, which allow villagers to easily recharge their electronic devices.